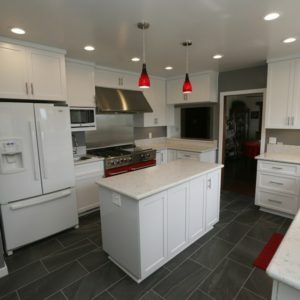 Depending on the scope of your project,Kitchen remodeling in La Palma CA has the potential to involve many challenging tasks, from installing perfectly level countertops and cabinets to rerouting plumbing and gas lines. Naturally, you need an experienced contractor like Cabinet Magic to make your project a success. Cabinet Magic offers the quality construction and installation services you expect from a licensed contractor, along with excellent prices on designer products and as much or as little design assistance as you may require. Going for a bold new look with kitchen remodeling in La Palma CA can be exhilarating. But you may also feel a little bit worried. For example, you may worry that your flooring and countertop won’t complement one another like you’d hoped, or that the color you’ve chosen for your cabinets will be too dark once a whole wall of cabinetry is installed. At Cabinet Magic, we believe being able to accurately visualize your kitchen remodeling in La Palma CA before work begins is key to being satisfied with the final result. That’s why we offer 3D computer rendering services on every remodeling project. By giving clients a “preview” of the finished job, we offer an opportunity to make any necessary design changes before work begins. Custom cabinetry really is a must for any high-end kitchen remodel. With Cabinet Magic as your remodeling contractor, it’s easy to get the exact look and functionality you want from your cabinets, because we have an entire factory dedicated to custom cabinet making. We offer a complete range of styles from modern to traditional, along with virtually any color of paint or stain you could want. We even offer custom crown molding for cabinets. Our cabinets are sturdily built to stand the test of time and incorporate high end features like soft-close hidden hinges and smooth drawer slides that make them a pleasure to use. Would you like more information about working with Cabinet Magic on your kitchen remodeling in La Palma CA? Call us at 800-828-4380 or contact us online to schedule a free in home consultation. We can help you price the upgrades you want and give you a free estimate.